General - Are KhEC & KhCE same? 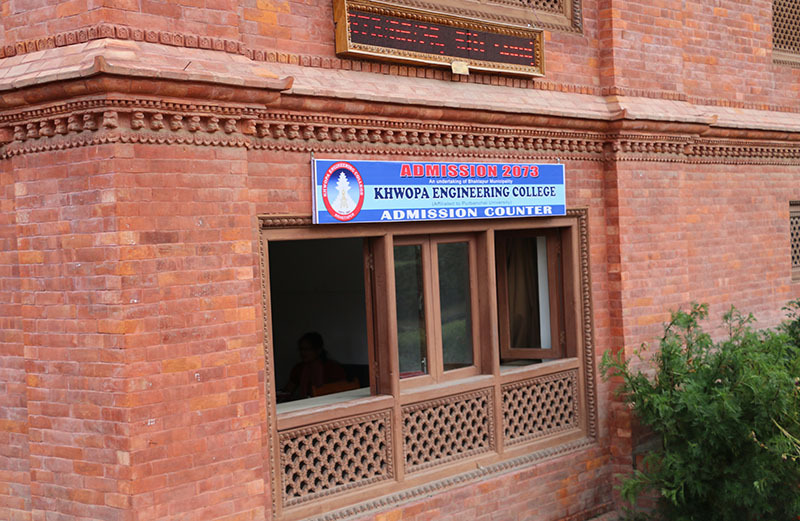 No, Khwopa Engineering College (KhEC) is affiliated to Purbanchal University & Khwopa College of Engineering (KhCE) is affiliated to Tribhuvan University,. General - Can a student be awarded with more than one scholarship ? No. But, the candidate can choose the better one for him/her. College - Is there hostel facility in college? No, there is not such facility. But there are several private hostels nearby. Services - Does the college conduct any career based counselling programs ? Yes, counselling programs are conducted from time to time. Experienced professionals in the respective fields are invited for their valuable suggestions and sharing their working experiences with the students. General - How are students involved in the practical field of their respective courses? College organizes different expos and exhibition at certain intervals for improving students' practical skills in their fields. Students also get involved and participate in different competitions organized by various organizations of their respective fields. Services - Can I get extra classes in college? Yes, it is possible to get extra classes if requested by a group of students. General - Can any student change their running department? Yes, in certain circumstances if it is timely attempted. For instance, in the case of departments like BE Computer and BE Electronics and Communication one can change one's running department within fixed time of their course start. It also applies to other departments if it is early. General - Is parent meeting conducted timely? Yes, it is conducted timely on the requirement basis. General - When deposite can be refunded? Deposite can be refunded only after passing out from the college. Scholarship - What kind of interview is conducted for scholarship? Student should describe his/her family and financial background and must provide the valid reasoning for the scholarship. Scholarship - What should student do for scholarship? Student should fill the form with all their required description and documents and also must give an interview. Scholarship - Does college provide any scholarship? College provides full or partial scholarships for diligent and poor students. It also provides scholarships on the basis of academic performance of each semester. Process - Can I get transfer or be transferred from another college? Yes, you can if you have the transfer certificate along with all other necessary documents from the college you are being transferred from. Without the necessary documents you cannot get the permission from the university and cannot get admitted to the college. Services - What is internship procedure? Usually a test is taken and educational qualifications are observed. Students who are selected are allowed to work in their internship programs. Services - Does college provide any internship programs? Yes, college provides internship programs for the students who are better at their respective fields. Campus Life - What are some ways to stay active in college? You must be interactive with everyone mainly with teachers. You must take part in all possible programs organized by college. General - Is there any online payment procedure? No, there is no such provision till date. Resources - What advising and support services are available? Various Programs and Workshops are organized timely to motivate the students. Apart from this, councelling facility is provided to help the students to grab the right path. Admissions - How much time duration is there between eligible list publication and admission fee submission? First you are called for interview. Within 2-3 days of interview you should submit admission fee based on availability of seats because the seats are filled by the procedure of First Come First Basis Admission. General - What extra curriculum activities are conducted in college? Indoor games competitions, like Chess and Table Tennis, are conducted in summer season, and outdoor games competitions, like Badminton and Football are conducted in winter season. Any student of any level can take part in them. General - Is college uniform compulsory? Yes, it is compulsory to be in uniform. Student without uniform is not eligible to attend the class at any cost. Process - What is the procedure for interview? Some oral exams regarding your previous study percentages, regarding college rules and regualtion and regarding your discipline are conducted in the interview. Application - Can I get online form facility? No, you have to visit Admission Counter for Application Form. Admissions - What is the admission procedure? Student must fill up entrance form and take the entrance exam conducted by Purbanchal University. If student passes the entrance, he/she will be eligible for interview. After students are approved from interview ,then they can submit their admission fee in account section and submit other required documents in administration section.